* This speaking fee is inclusive of airfare, hotel, ground transportation, food and all other miscellaneous expenses. This fee also includes pre-speech interviews so James can customize his presentation to meet your goals and objectives of your meeting. Additonal savings are available if you select his "Pre-Pay Option." Ask for more details on this option. Whether your audience is 8 or 800, in North America or abroad, James can deliver a tailor-made message of inspiration for your next conference. One of the most gifted story tellers and keynote speakers. James Connolly's philosophy is based on understanding your audience and company culture, then inspiring them to take action so you can achieve extraordinary results in your life. 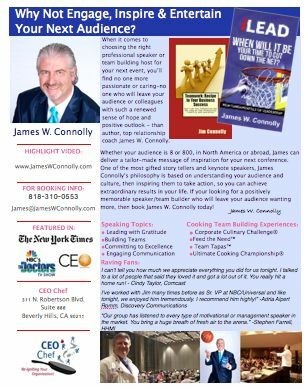 If your looking for a positively memorable speaker who will leave your audience wanting more, then book James W. Connolly today! Your team is so unique and special that we'd like to help you design & match the right keynote message for you. Give us a call 888-308-8326 , email us at Connect@CEOChef.com or better yet, schedule a time convenient for you!